It’s difficult to know what direction to turn in when one makes the vague goal of “reading more Faulkner.” Once you’ve read the ones that everyone talks about (The Sound and the Fury and As I Lay Dying, in my case) where do you go next? Short stories? Random other novels? In an effort to forge a clearer path I decided to start with what was offered in my local public library. This ultimately led me to choose Faulkner’s Sartoris as my next step. 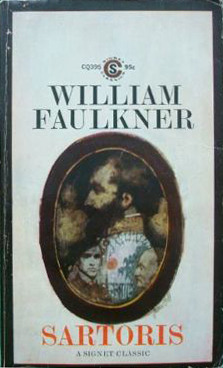 Though I’ve read that this isn’t often considered to be one of Faulkner’s best works, it is nevertheless an important one because it lays the foundation for his later novels and stories. Though the events of this novel take place in the early twentieth century, “the thematic action of Sartoris takes place not over a period of months but in a time span covering four generations, flanked by the Civil and First World Wars and by the two John Sartorises” (Vickery). What has always stood out to me the most about Faulkner’s novels is how character driven they are in every sense. The plot seems almost secondary, as though all that really matters are the thoughts within and relationships between the characters. (And sometimes this is all we are ever given!) In some ways it feels like more happens in texts that are steered by characters rather than plot because we are always learning more about characters’ changing beliefs, values, and attitudes as the story progresses. It’s also really fascinating to look at what certain characters may represent in the big picture of a text. For instance, one could possibly argue that Old Bayard and Young Bayard are reincarnations of Colonel John Sartoris to a certain extent (at least, that’s what crossed my mind while reading this novel). They both present different sides of their risk-taking, stubborn ancestor yet ultimately end up facing similar ends. Here we see the creation of a sort of myth surrounding the Sartoris family, a dark and twisted tale that casts a shadow over future Johns and Bayards. Put simply, “the Sartorises chose to act in terms of legend instead of history” (Vickery). Much to my chagrin, Faulkner is rather fond of giving multiple characters the same name. When I first started reading Sartoris I was so confused by the many Johns and Bayards that I actually created a character web or family tree of sorts in an attempt to keep them all straight in my mind. However, I thought this would be a much larger hindrance than it ended up being in the long run because the characters became more defined as I became more invested in the story. In fact, the links between the characters– both linguistically with names and in terms of their relationships and personalities– soon became my favorite aspect of this novel. Faulkner uses the Sartoris family to ask a fascinating question: Are these events caused by the fate of the family or a logical cause-and-effect reaction? In other words, are these people responsible for their actions or have they already been destined (or doomed)? One of the most surprising aspects of this novel for me is Faulkner’s focus on the female characters. Though the novel mainly focuses on the male line of the Sartoris family as a subject, we often view these men through the eyes of the women in their lives. For instance, we learn a lot about Young Bayard through his interactions with Narcissa Benbow, who reads to him when he is bedridden. Arguably the most prominent character in this novel is Aunt Jenny, the younger sister of Colonel John Sartoris. She is headstrong, opinionated, and bold; one can see how she would have been quite a match with Sartoris when he was alive. These two women act almost as foils to one another, representing two very different generations of women. Perhaps Aunt Jenny’s mental decline towards the end of the novel and Narcissa’s creation of life through her newborn son indicates that the old traditional way of life for Southern women is being replaced by a new one. In some ways, it seems to me as though these women could be considered the true protagonists of the novel. Overall, Sartoris might possibly be my new favorite Faulkner novel. I’ll stop this review here before I start rambling on and on about how much I loved this novel— there are just so many interesting aspects to discuss! It’s safe to say that I’ll definitely be rereading this at some point in the near future. Would I recommend it to a friend? : Absolutely! This will surely be near the top of my Faulkner recommendation list from now on. What are your thoughts on Sartoris? What other works by Faulkner would you recommend? What is your favorite Faulkner novel or short story? Let me know in the comments section below! I’ve never read Faulkner before and I feel like I’m missing out! The fact that his characters had mostly the same names and yet he made them all so unique you could distinguish them by their personality traits shows true mastery. I really like his portrayal of women, too. Thanks so much!! 🙂 I definitely recommend giving some of his books a try if you’ve never read them before. Let me know what you think if you do! OMG that’s such a good comparison between Sartoris and Wuthering Heights!! Although I think the same names are much more bearable in this novel 🙂 Definitely let me know your thoughts if you pick this one up!